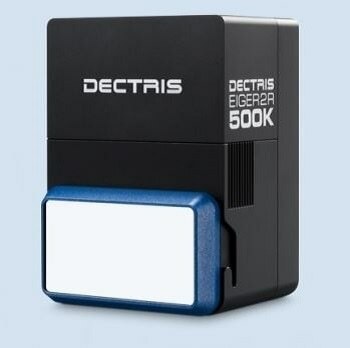 DECTRIS is the global leader in hybrid photon counting (HPC) X-ray detection. Last year, AZoM spoke to Marcus Müller, Product Manager XRD at DECTRIS, about the newly launched EIGER2 R 500K detector. Recently, two more detectors of the same series were announced. What are the new detectors and what difference can they make in X-ray measurements? Has the EIGER2 R 500K meanwhile become a success and what do users like about it? We spoke with Marcus again to find out more. What are the new detectors that you recently announced? We announced the EIGER2 R 1M and 4M detectors at the International Small Angle Scattering Conference in Michigan. The new detectors complement the previously released EIGER2 R 500K to form a complete series with a detector for every need. The major difference between the three models is the size of the sensitive area and cooling. The EIGER2 R 500K features an active area of 77 by 39 millimeters in a highly compact housing and is air cooled. The 1M and 4M feature active areas of 77 by 80 and 155 by 162 millimeters, respectively. Both use water cooling to stabilize their operating temperature at 23°C. Which X-ray applications are you targeting with the new detectors? We expect the new detectors to be mostly used in small-angle X-ray scattering (SAXS) and single-crystal diffraction in the home lab. However, they excel in any X-ray application where the lowest possible background, highest efficiency, and the best possible data quality are crucial. In particular, for SAXS, EIGER2 R has an ace up its sleeve: The detectors can be operated in a vacuum to minimize scatter and absorption from air and windows. The EIGER2 R 1M is a highly versatile detector. It is big enough for single-crystal diffraction, both small molecule and macromolecular, and SAXS. It also provides a high-end detector solution for 2D XRD. The EIGER2 R 4M is our flagship detector for X-ray diffraction and scattering in the home lab. Its large size provides unsurpassed collection efficiency and allows you to tackle the most ambitious projects. It has been a year since we last talked about the EIGER2 X-ray detectors. Can you please remind us what distinguishes this detector family? Like all DECTRIS detectors, EIGER2 is based on Hybrid Photon Counting (HPC) technology. This puts EIGER2 ahead of many other X-ray detectors because HPC eliminates detector background and maximizes signal to noise. Thanks to direct detection, this technology also achieves much higher resolution than, for instance, scintillation based X-ray detection. These are great benefits common to all HPC detectors. What sets EIGER2 apart from other HPC detectors is the readout chip we designed at DECTRIS. It goes beyond the performance of the successful EIGER detectors in three important ways. EIGER2 provides two energy discriminating thresholds that enable the suppression of high-energy background such as cosmic radiation. This is great for laboratory applications requiring long exposure times such as SAXS because the weakest signals can be measured accurately. Two 16-bit digital counters are associated with each of the two energy discriminating thresholds in every pixel. This means you can collect successive images without any dead time and still benefit from the highest dynamic range made possible by dual-energy discrimination. Thanks to DECTRIS Instant Retrigger Technology, EIGER2 overcomes the paralysis of regular counting detectors at high rates. This provides superior count rate performance. Even the highest intensities can be measured accurately, no matter what laboratory X-ray source and sample you are working with. The EIGER2 R 500K is now available for about a year. Has it become a success and what do users like about it? The EIGER2 R 500K has already found its way to many customers and users. They appreciate the technological advantages that I mentioned previously. For a good number of users, the EIGER2 R 500K is the first HPC pixel detector they work with. These users are often thrilled about the data quality, dynamic range, and resolution which is much better than what they were used to. What users like specifically about the EIGER2 R 500K are its compact size, versatile form factor, and air cooling. This opens up many possibilities to our OEM partners for integrating the detector in their instruments and to customers who want to design and realize their own setup. What else is new about the EIGER2 R 500K? As I have mentioned before, placing a detector inside vacuum minimizes scatter and absorption from air and windows. Therefore I am happy to say that we can now also offer the EIGER2 R 500K with optional vacuum compatibility, same as its larger siblings. Where can our readers find out more about the new EIGER2 R detector series? Further information and detector specifications are available on our website. We will also be happy to answer questions and give advice about which detector model is best for you. Just contact us at [email protected] with a short description of what kind of X-ray experiments you are up to. Marcus Müller, PhD is the Product Manager XRD at DECTRIS and is responsible for their OEM partners.